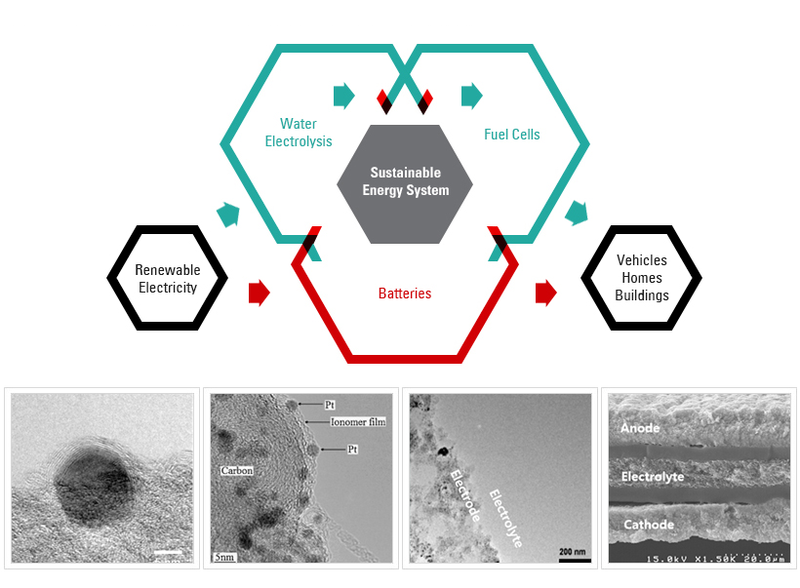 The ECSM group focuses on the development of new materials for sustainable energy devices; fuel cells, electrolyzers, and next generation batteries. Taking a materials science approach, we explore the relation between synthesis, structure and properties of electrode materials. A better insight in the electrochemical reactions leads us to an increase in activity and stability of the nanoparticulate catalysts and the electrodes. 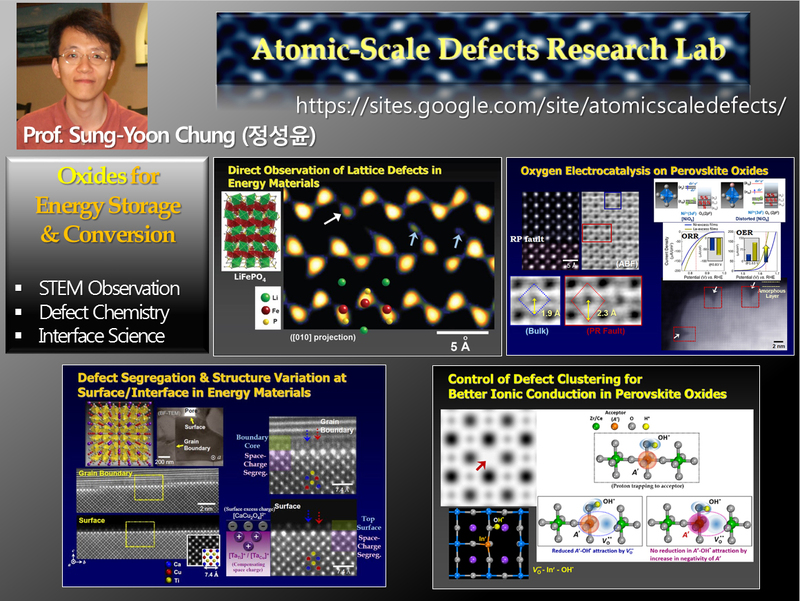 Our research focuses on condensed-matter physics and materials chemistry of metal phosphates and oxides, and materials design and synthesis for advanced lithium batteries, covering atomic-scale characterization with HREM and STEM, and nanostructure control of materials interfaces. 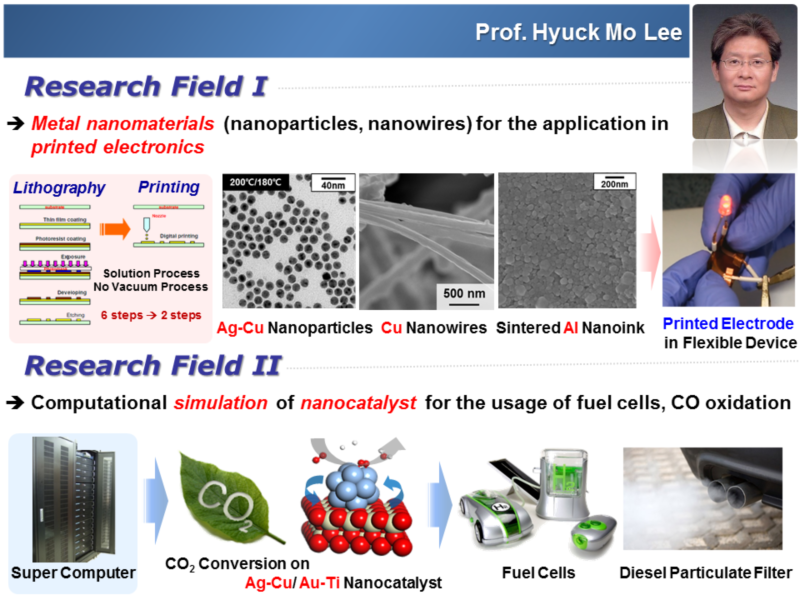 Our group is by prof. Do Kyung Kim, established at KAIST in 1994. 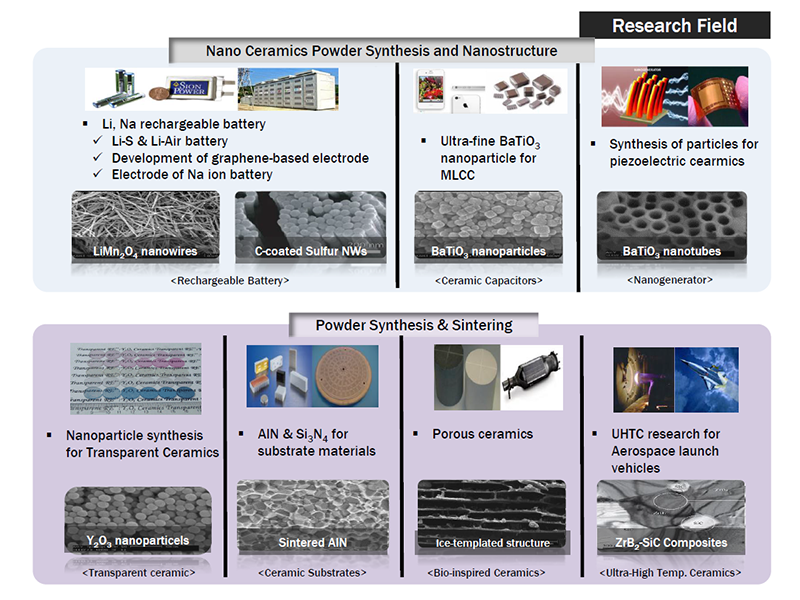 Research Fields of our group are a variety of nano ceramic materials including rechargeable batteries, ultra-fine particle synthesis, transparent ceramics, piezoelectric particle, UHTC and porous ceramics. 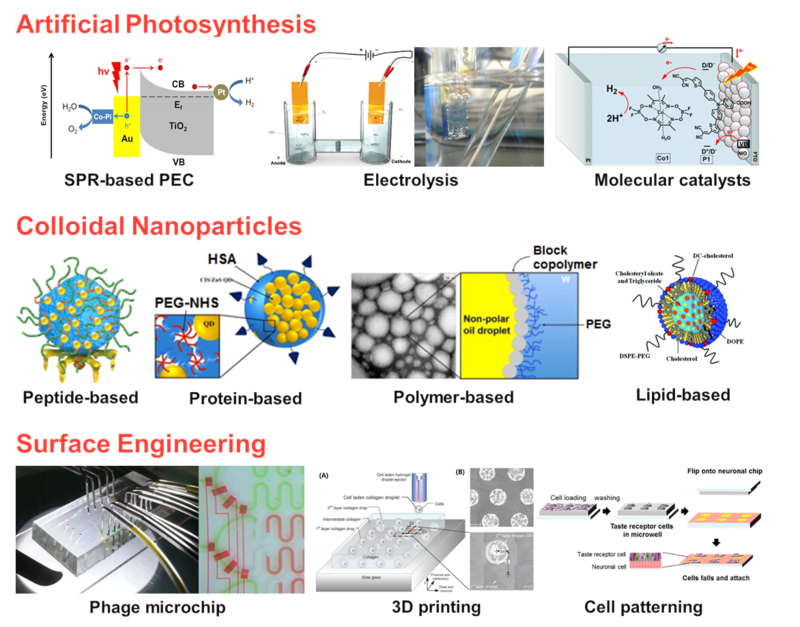 Advanced Nanomaterials and Energy Lab. 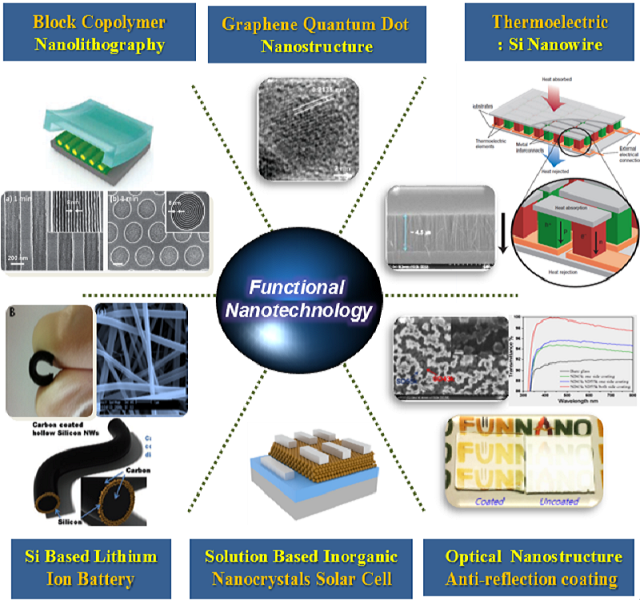 ADVNANO is focused on novel synthesis of inorganic nanomaterials optimized for applications in ultra-sensitive chemical sensors, highly efficient energy storage devices, and functional electronics including transistors and transparent electrodes. 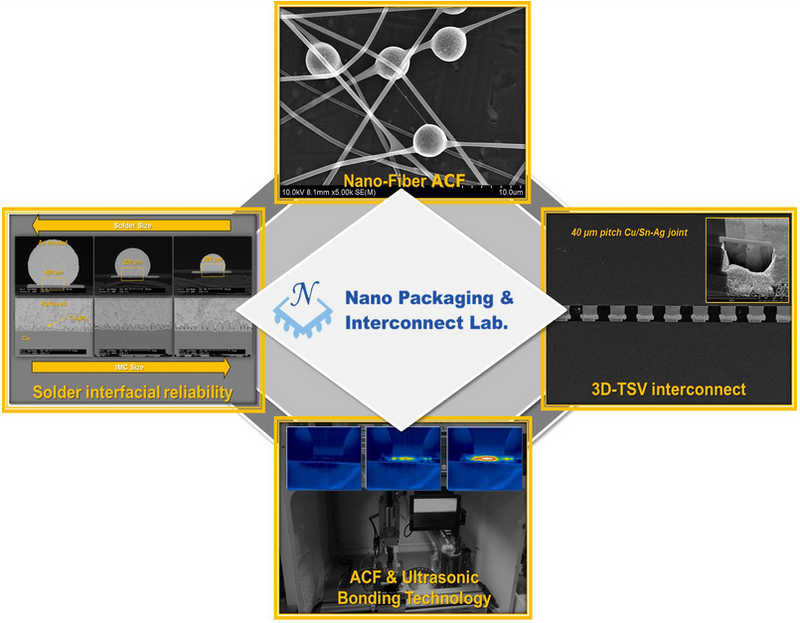 Our researches aim at developing novel fabrication methods that relies on a modified electrospinning and polymeric templating routes to produce various nano-building blocks. 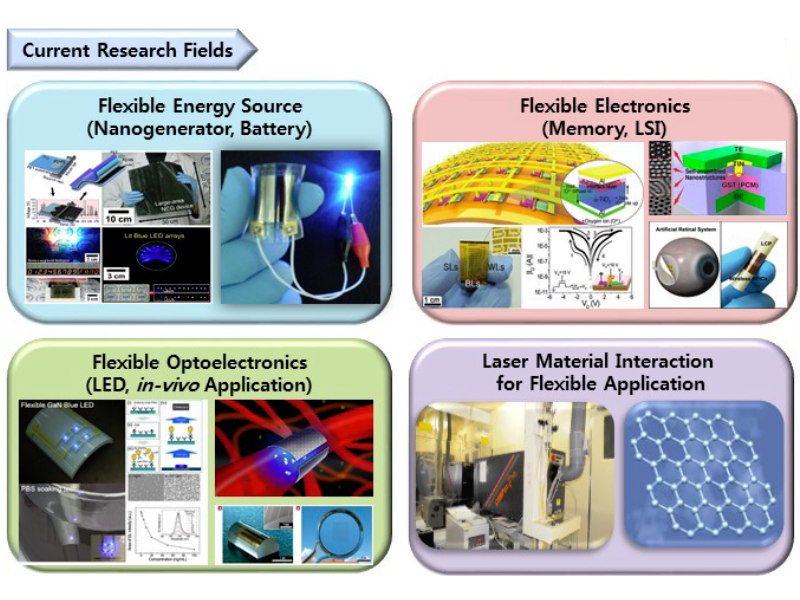 Our FAND research goal is to develop 'Self-powered Flexible Electronic Systems' using high performance nano-materials and soft electronic technologies. This technology could provide opportunities for printable electronics such as flexible displays, artificial skins, biosensors, roll-up communication, and biomedical applications. 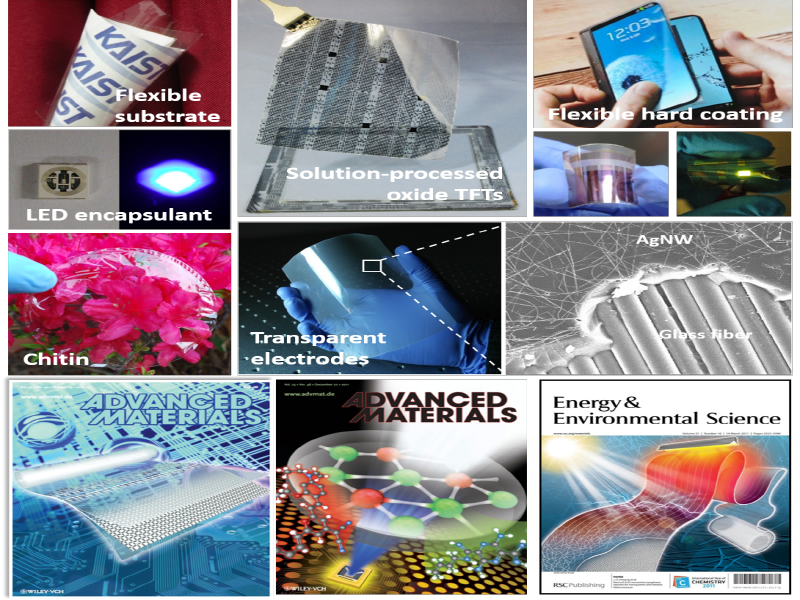 We develops flexible self-powered energy source, flexible memory and large scale integration (LSI), flexible optoelectronics, and laser material interaction. 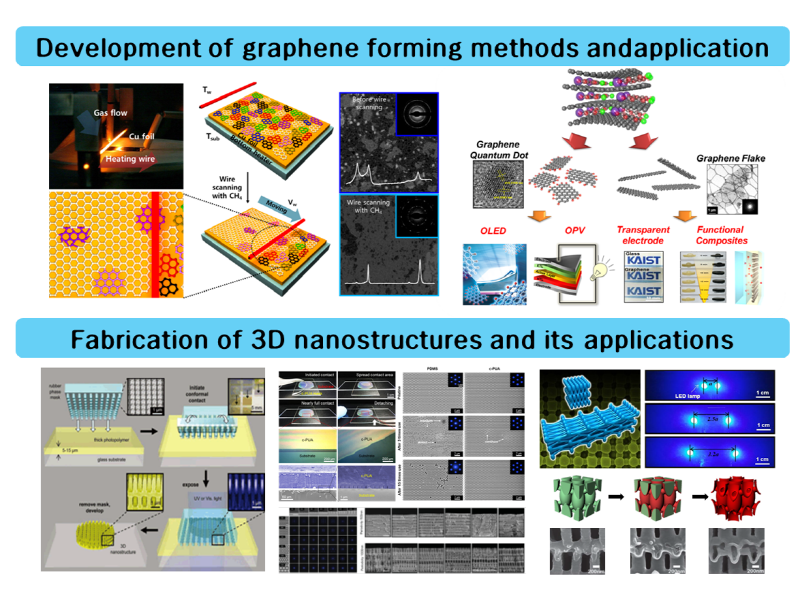 We are interested in designing and making new functional structures through assembly of molecules and nanoscale materials. Biological diversity and natural selection processes play a critically important role in morphogenesis and optimization (or adaptation). 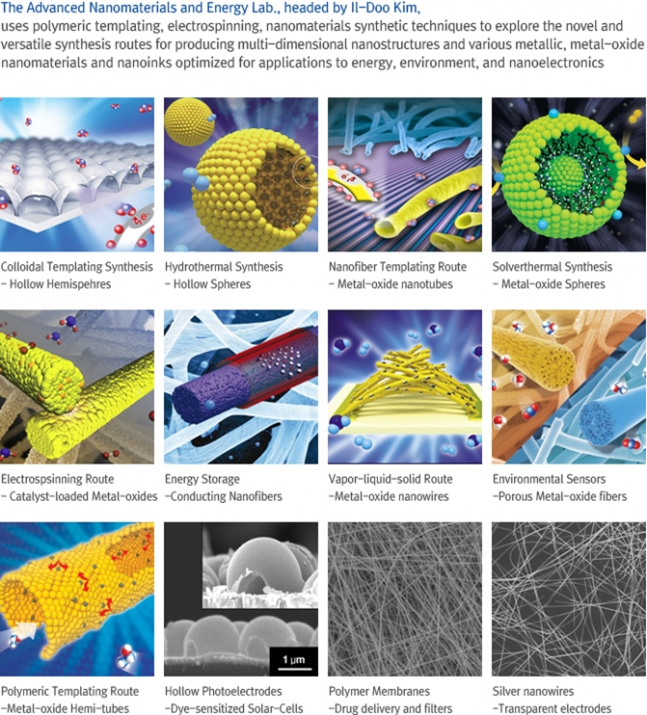 We aim to identify key molecules and processes, re-create and engineer nanoscale structures, and utilize them to develop materials practically applicable to commercial products. 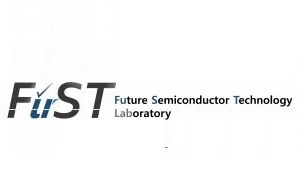 MaSTLab (Materials for Sustainable Technology Laboratory) was established in 1988 as EOMLab (Electronic and Optical Materials Laboratory) and has been one of top leading research groups. 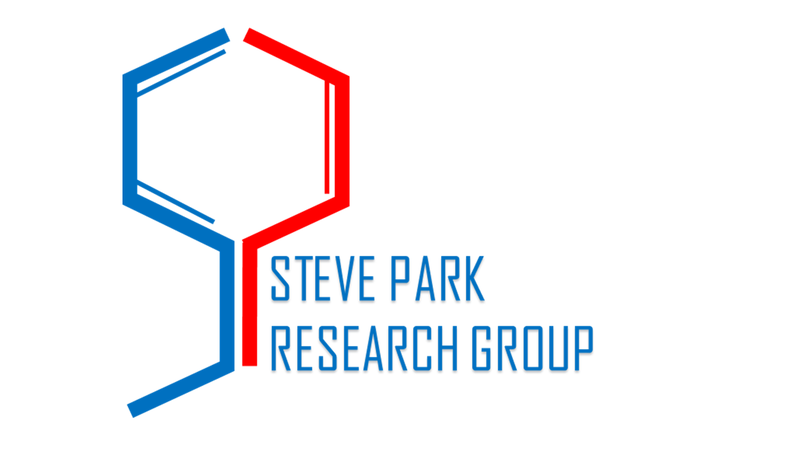 The present research topics include sustainable energy sources, including nano generators, piezoelectric energy harvesters and fuel cells; Electro Active Polymer (EAP) materials and devices; photocatalytic water splitting; and water and electric power system design for developing world. 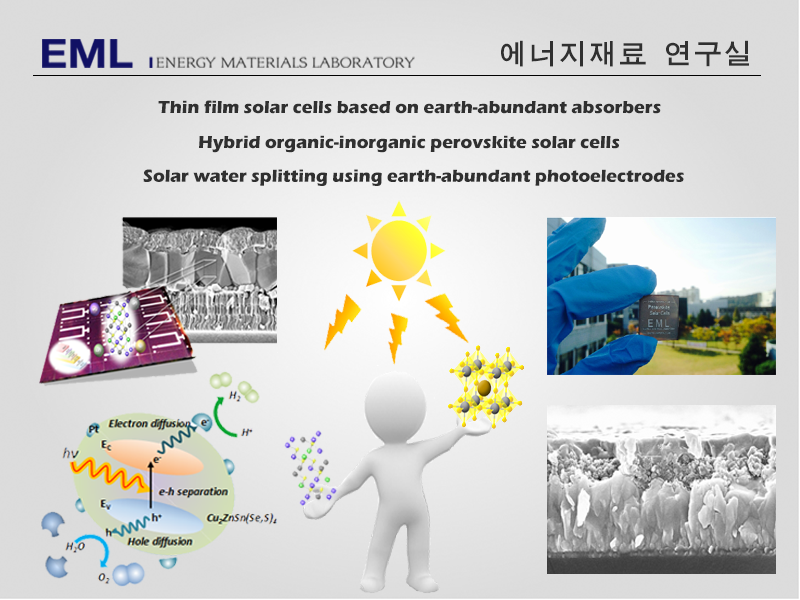 e LE&S work on the exciting field of solar energy conversion and storage by designing and developing innovative and transformational nanomaterials. We recently focused on fabrication of Si-based photocatalysts or electrocatalysts toward efficient and selective CO2 reduction and photovoltaic-electrolyzer for highly efficient and durable solar driven water splitting. 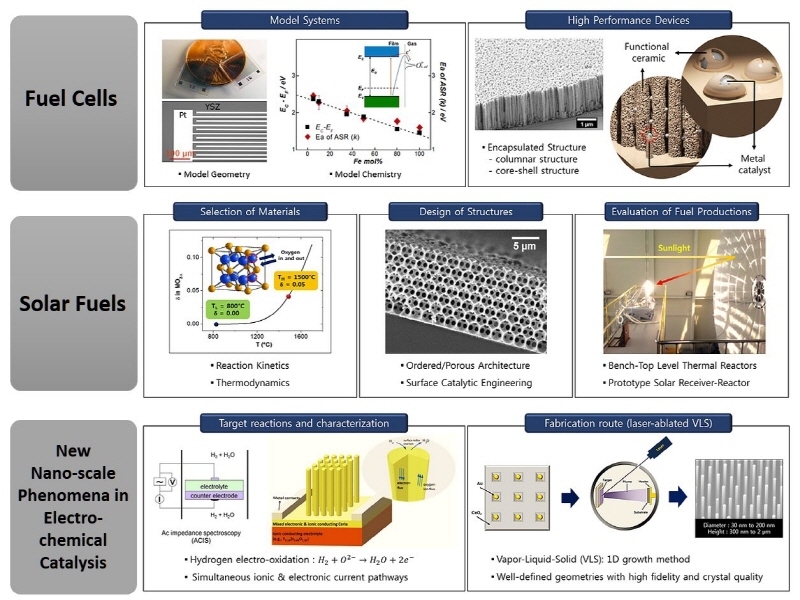 We also focus on fabrication of ultra-thin kerf-less single crystal semiconductor for cost-effective and high performance solar cell application. The interest of our Lab. is to develop novel electronic devices and systems utilizing electron's spin, so-called spintronics and to understand underlying physics of magnetic nanomaterials. The spintronics is a newly emerged research field which hold promise to have interesting opportunities for applications in various types of magnetic memories, sensors, energy conversion, and bio-related technology. 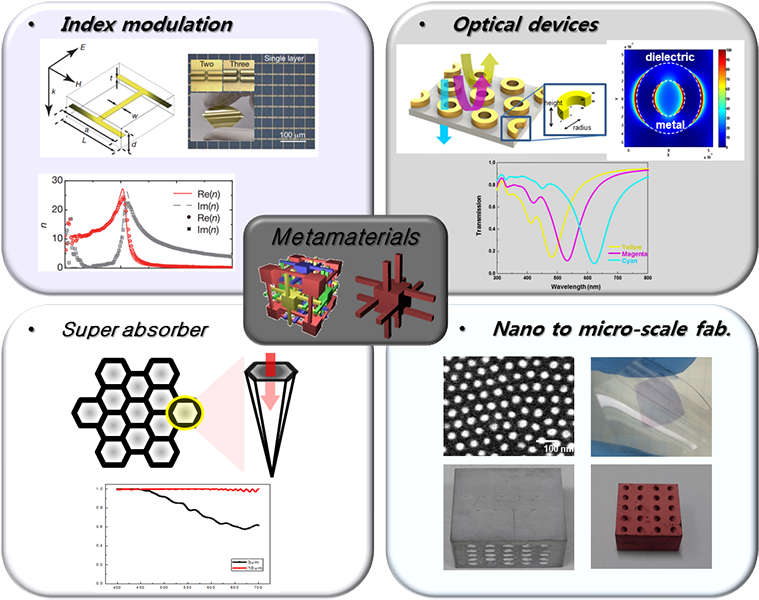 Our research group focuses on the creation of new biomaterials by the hybridization of bio-organic and inorganic materials. In particular, we are interested in the development of functional biomaterials through the inspiration from nature. The coupling of biological inspiration with nano-scale design can lead to enhanced performance and properties of materials for evermore demanding applications to energy/environment (e.g., artificial photosynthesis, solar bioprocess, bio-organic batteries) and healthcare (e.g., amyloid self-assembly, biosensors, wearable bioelectronics). 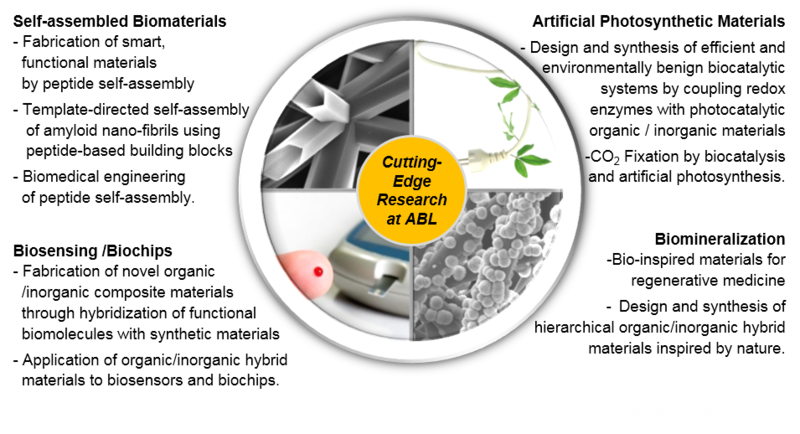 Our research subjects primarily comprise the structure-property relationships of (a) nano-structured bulk materials for automotive/bio-medical applications and (b) nano-structured magnetic thin films for magnetic recording media. 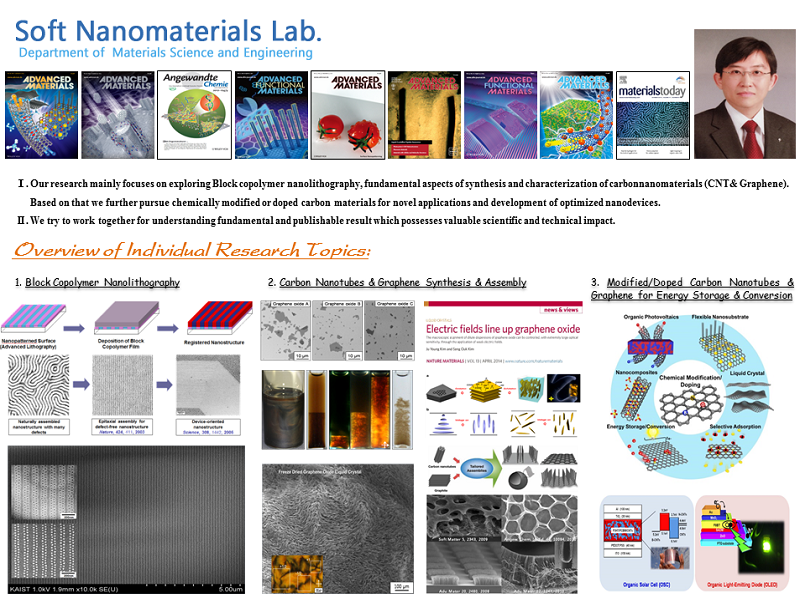 Soft & Smart Materials & Devices Lab. 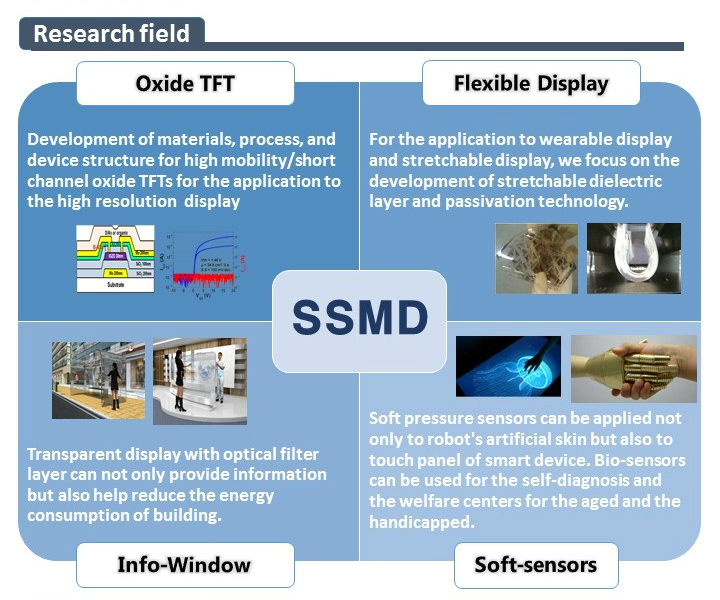 Research areas in the SSMD Laboratory include development of materials (semiconductor, dielectric layer, and metal films) and fabrication of ‘Oxide-TFT’ for the application to the high-resolution/large-area display, flexible display, hologram, transparent info-window, and development of soft sensor for the bio-materials. Also, we will expand works to the emerging high performance 2D transistor, flexible circuit, and disposable soft sensor.